NEW: Agricultural District #3 Review Worksheet available here. Please return to the Montgomery County Business Development Center (9 Park St. Fonda, NY, 12068) by Friday, April 5. New York’s Agricultural Districts Law, Article 25-AA of the NYS Agriculture and Markets Law, was enacted in 1971 to help keep farmland in agricultural production. The ADL recognizes that agricultural lands are important and irreplaceable resources, which are in jeopardy of being lost to as a result of increasing costs of agricultural businesses, development pressures and regulatory constraints. The Law seeks to create economic and regulatory incentives which encourage farmers to continue farming. The ADL has two basic components, agricultural assessments for taxes and agricultural district creation and review. Modifying the ability of public agencies to acquire farmland through eminent domain. Directly reduce or increase tax assessments—agricultural landowners can apply to the local tax assessor for an annual agricultural assessment. Montgomery County has long recognized the importance of agriculture. To place additional protection on our valuable agricultural lands, the first agricultural district was created in 1975 in Montgomery County. The County currently has 3 separate agricultural districts, which cover approximately 176,000 acres or about 2/3 of the County. These districts consist of viable agricultural lands, or, in other words, lands that are currently used for agriculture or may be used for agriculture in the future. Therefore, agricultural districts may include not just farm fields, but also residential, forested, and commercial properties. The agricultural districts are not permanent, but instead change through time. Every 8 years, the County reviews each district and the County Legislature decides whether to continue, terminate or modify the district. In the past, some districts have been merged together. Individual parcels are also added and removed from the districts during this 8-year review process, so the districts better reflect current land use. 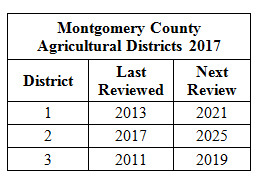 Finally, property owners may request to have their parcels added to an agricultural district during the Annual Review, which takes place from September 1st to September 30th in Montgomery County. The Annual Review is open to any of the agricultural districts in the County, so the districts may change even on a yearly basis. 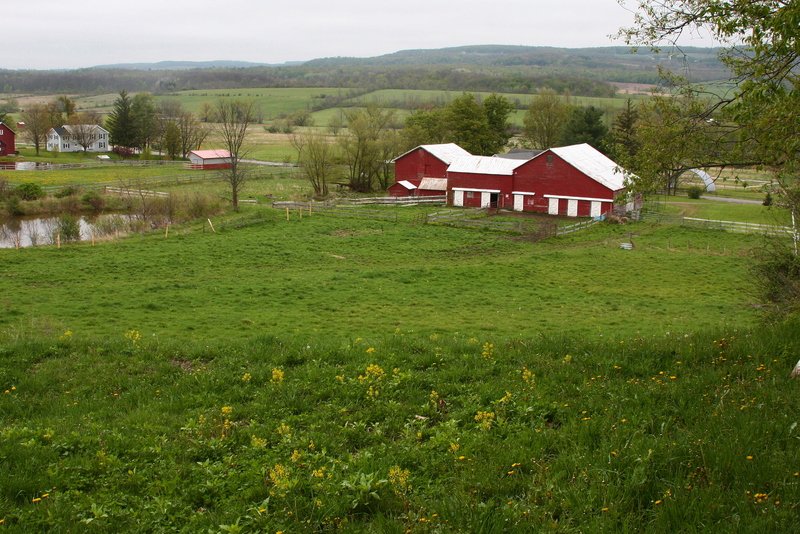 Agricultural Districts are reviewed by the County and re-certified by the New York State Department of Agriculture and Markets every eight years. During the review, landowners can decide if they want their property to remain in the District, or be removed or added. Owners of property within the Agricultural District will receive a mailed written notice of review. Agricultural districts are reviewed by the County and re-certified by the New York State Department of Agriculture and Markets for agricultural viability every eight years. During the review process landowners can elect to have their land remain in the district, remove their land from the district, or add land to the district. Please note that while land can be added to an agricultural district each year through the annual additions process, land can only be removed through the eight-year review process. Landowners who want their land to remain in an agricultural district do not need to take any action during the eight-year review. After the open period ends, the County Agriculture and Farmland Protection Board will review the requests and prepare a report that is submitted to the County Legislature for their consideration. The Legislature will then hold a public hearing to receive feedback on the requested modifications, if any. Once the County Legislature has approved of the changes, the report is finalized and sent to the New York State Department of Agriculture and Markets for re-certification of the District. This process typically takes eight to ten months. Landowners can request to have their property added to an Agricultural District during the County’s Annual Additions open enrollment. Property can only be removed from an Agricultural District during the eight-year review and certification process described above. 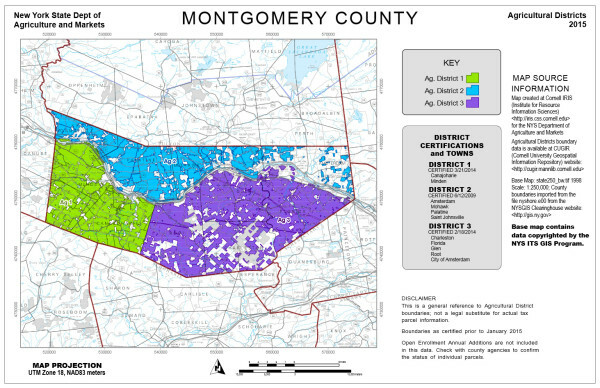 The Montgomery County Agriculture and Farmland Protection Board announces that the next annual open enrollment period for the addition of viable agricultural lands into Montgomery County Agricultural Districts will take place September 1- 30, 2018. Note that property can only be removed from an Agricultural District during the District’s eight-year review. Agricultural Districts are intended to encourage the continued use of farmland for agricultural production. 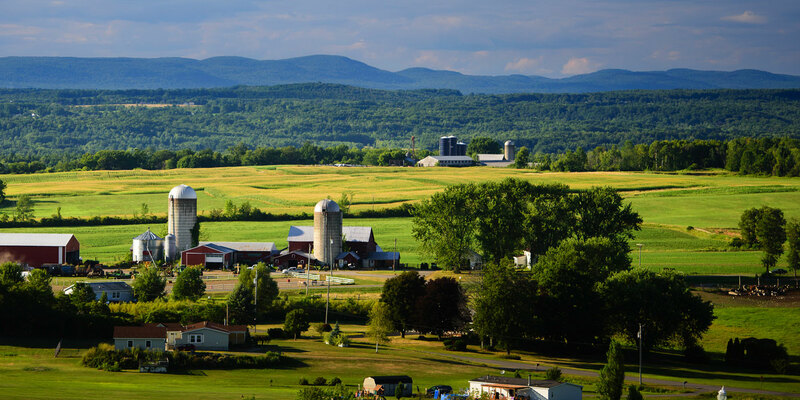 Enrollment of viable agricultural lands into a State certified Agricultural District provides protection of accepted agricultural practices through New York State Agricultural Districts Law. Viable agricultural land is land highly suitable for, or currently used for, agricultural production. No. Being in an agricultural district does not prohibit the selling of land. The ADL does not restrict the transfer of real property. The ADL does provide for a real estate transfer disclosure by the seller to the prospective purchaser. The disclosure states that the property is located within an agricultural district and that farming activities including noise, dust, and odors occur within the district. Prospective residents are also informed that the location of the property within an agricultural district may impact the ability to access water and/or sewer services. “Farm operation” means the land and on-farm buildings, equipment, manure processing and handling facilities, and practices which contribute to the production, preparation and marketing of crops, livestock and livestock products as a commercial enterprise, including a “commercial horse boarding operation” as defined in subdivision thirteen of this section, a “timber operation” as defined in subdivision fourteen of this section and “compost, mulch or other biomass crops” as defined in subdivision sixteen of this section and ”commercial equine operation” as defined in subdivision seventeen of this section. Such farm operation may consist of one or more parcels of owned or rented land, which parcels may be contiguous or non-contiguous to each other. Right now, you will have to call Montgomery County Business Development Center to determine if you are in an agricultural district or you may visit the NYS Ag and Markets website to see a general agricultural district map. Districts are usually reviewed, or renewed, every 8 years. The County Legislature, after receiving the County Agricultural and Farmland Protection Board report and recommendations, and after a public hearing, determines whether the district shall be continued, terminated, or modified. During the review process, land may be added or deleted from the district. Counties are also required to designate an annual 30-day period when landowners may petition the County for inclusion of viable agricultural lands in an existing agricultural district. In Montgomery County, the annual review takes place from September 1st to September 30th each year. You can find an application here. Everyone benefits. Besides its value for the production of food, agricultural land provides many environmental benefits including groundwater recharge, open space, and scenic view sheds. Agriculture benefits local economies too, by providing on-farm jobs and supporting agribusinesses. Agricultural land requires less public services than developed land and results in cost savings for local communities.